MAGTEC, one of the UK's leading manufacturers of electric drivetrains for single- and double-decker buses, has moved into new premises in Rotherham as it wins new orders to repower bus fleets across the UK and in Europe. Founded in 1992, MAGTEC designs and manufactures electric drive systems and components for a wide range of applications including trucks, buses and military vehicles. The UK's largest manufacturer of electric drive systems for commercial vehicles has relocated its Sheffield truck conversion facility to Templeborough in Rotherham, taking over the 16,000 sq ft unit previously home to expanding firm, Bluetree Design & Print. The new facility at Bessemer Business Park incorporates MAGTEC vehicle workshops, fabrication facilities, a design and engineering function and a sales office. The site offers quick and easy access to the M1 and a high power capacity of 288 KVA. 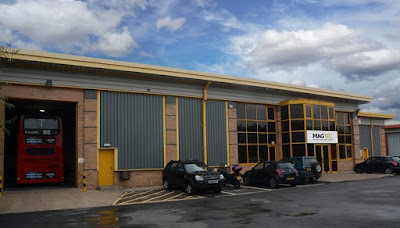 MAGTEC has also taken on a second manufacturing site in Sheffield of 27,000 sq ft that will feature motor and transmission manufacturing facilities, alongside power electronics manufacturing and state-of-the-art testing facilities. Simon Buckley, programme manager at MAGTEC, said: "It's an indicator of the rapidly expanding market in green transportation that we're relocating to bigger and better premises. "This investment in additional facilities ensures that we'll be well-placed to continue meeting and exceeding our customers' expectations. Whether it's powering new vehicles or repowering existing ones, we're making sure we keep one step ahead of demand in this fast-moving sector." MAGTEC has won a total of 17 new orders to repower bus fleets across the UK and in Europe. Buses in locations from York to Marrakech will soon be running on EV drivetrains – helping to improve air quality and reduce noise pollution. An EV repower is an ideal solution for buses operating on inner city routes where high emissions and low fuel economy have a negative impact on both operators and users. The conversion from a diesel engine to EV can reduce operating costs by as much as 85% and will instantly enhance the asset value of any fleet. Maintenance costs are also significantly lower; brake wear is reduced and EV buses don’t require exhaust treatment or air filtering systems. Buckley added: "A typical return on investment for an EV repower is less than four years. MAGTEC's high-efficiency, low-weight systems have greater range, lower un-laden weight and use fewer batteries than competing systems. It's why we're at the heart of the electric bus revolution and why more operators than ever before are turning to us for an EV power or repower."